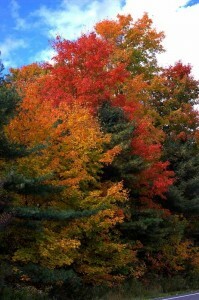 A Day Trip to See Fall Foliage, Lighthouses and Lobster! The latest in our Day Trip series (see Boothbay Harbor, the Kennebunks, Owls Head and to See Moose) is here, just in time to plan the perfect trip to see fall foliage in Maine, Lighthouses, and Lobster! From your base at Brewster House Bed & Breakfast in Freeport Maine, this day trip will take as much time as you want to give it. 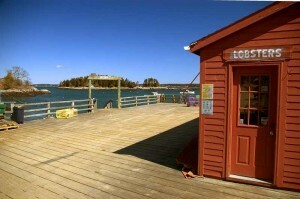 There are lots of choices, turning off the main highways to see fall colors, lighthouses and visit lobster shacks. Fall foliage season usually starts near the end of September and continues through October. 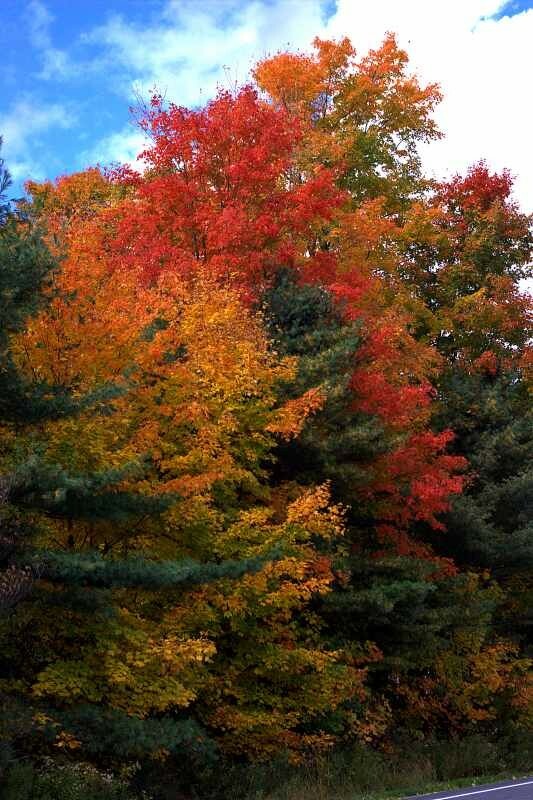 You can check the status of the foliage at the State of Maine foliage website, beginning September 14. Peak foliage generally starts in the far north and west of the state, then moves east and south. Besides the peak (which doesn’t last long), excellent foliage can usually be seen for quite some time on either side of the peak. Since there is almost always a part of US-1 that is full of color during the fall foliage season, after your delicious breakfast at Brewster House, we suggest going north from Freeport along US-1, for about 45 minutes, to Damariscotta, where the fall foliage view of the town across the Sheepscot River is postcard-perfect. Exiting US-1 there, and heading out Maine Route 131, the peninsula is full of color, on the way to Pemaquid Point light house, one of the most spectacularly scenic locations along the coast. Returning to Damariscotta, turn left just before US-1, and follow River Road through Newcastle and enjoy the foliage along the river, as you make your way to Maine Route 27, turning left toward Boothbay Harbor. Enjoy the lovely working harbor, and if it is time for a meal, try the Lobster Dock (they do close for the season some time between mid-October and the end of the month, so you may want to call ahead to be sure they’re open). Find time for an ice cream cone at Downeast Ice Cream (at the end of Wharf Street), before continuing on Route 27 toward Newagen, where you can see the seldom seen lighthouse known as “The Cuckolds” offshore. Return on Maine Route 238 to Boothbay, where you’ll take Route 27 back to US-1, then head south to Woolwich. Just before crossing the river to Bath, take the exit for Reid State Park. You’ll see nice foliage on Georgetown Island, and can enjoy the views at Reid, or continue on the Five Islands, and the Five Islands Lobster Shack for a wonderful meal on the dock (where you can also watch the lobster boats unload their catch, if your timing is right). If you’ve had enough driving, just return to US-1 and head back to Freeport for a bit of R&R and retail therapy. If not, take one more peninsula, by exiting US-1 at Cooks Corner, and take Maine Route 24 to Orrs Island and Bailey Island. The road winds through wooded areas and seaside, with plenty of fall colors, across the Cribstone Bridge connecting Orrs to Bailey Islands, and taking you past Cooks Lobster House, well-known for its fine lobster dinners. You can go the the end of the road (called, appropriately enough, Land’s End) on Bailey’s Island, where you can see in the distance the lighthouse called Halfway Rock Lighthouse. 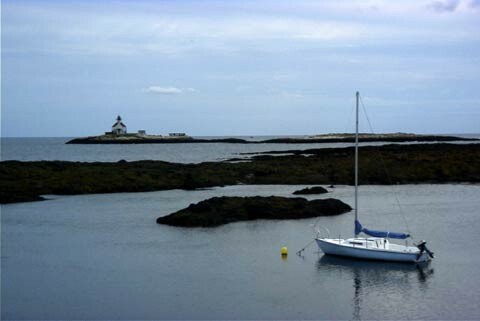 The lighthouse almost appears to be floating on the water, as the rock it sits on is covered at high tide. Returning on Route 24, watch for Mountain Road and turn left, cutting over to Harpswell and Route 123, to provide a different route back to US-1 via Brunswick, then back to Freeport.